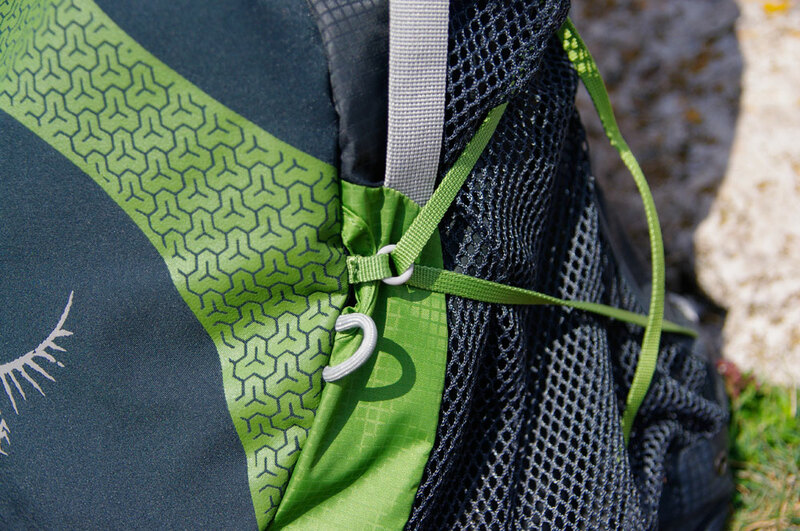 The Osprey Exos range was created to provide a lightweight but still featured rich alternative to other packs of the brand. It comes in three dimensions 34, 46 and 58 litres (for the size M) which weight respectively 960g, 1.05Kg and 1.14Kg. 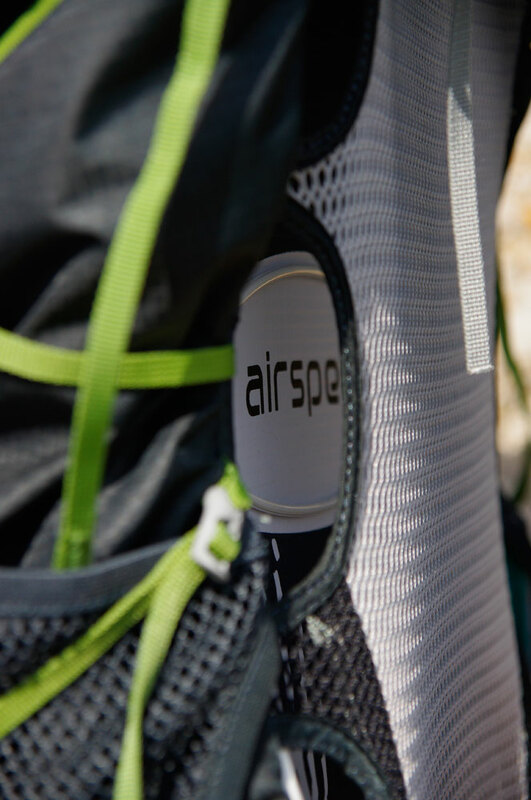 The other strong point of the Exos is its backpanel suspension to keep your back cool during physical activities. How does this translate in real life? Let’s find out. Picking up the Exos 34 the first thing you will notice, if like me you are more used to lower end packs, is the weight, or the absence of it. Osprey didn’t cheat on the numbers, it’s incredibly light. The fabric is thin and very flexible and seems well put together. It’s not the kind that will be easily torn off either and it looks reasonably waterproof. 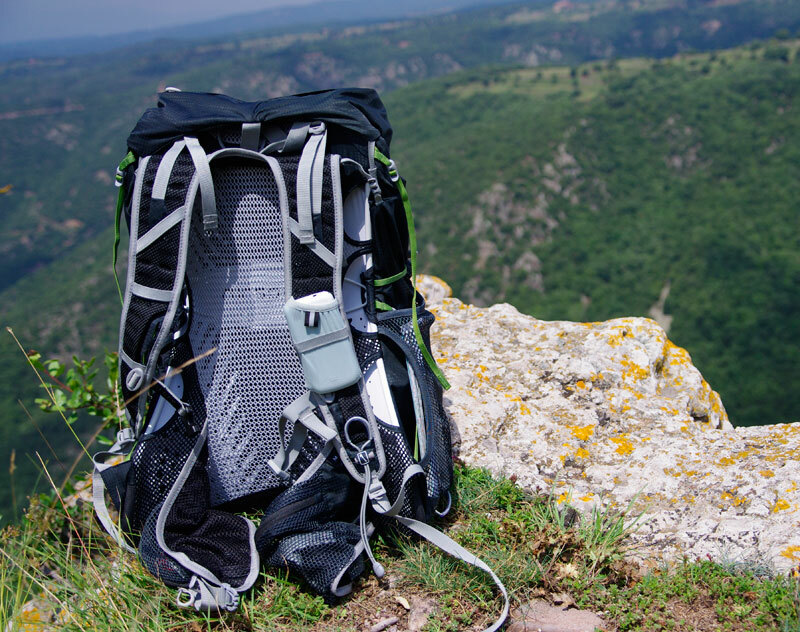 There is plenty of storage, with one large mesh pocket on each side which can easily accommodate a water bottle, a map or a guide. They are very accessible and convenient with one opening at the top and one on the side. The hip belt has also two small mesh pockets. There is one big pocket at the front, made out of stretch fabric and with a compression strap. Detail, there is a tiny hole at the bottom to evacuate water, as it is not waterproof. Finally the removable top pocket that provide a vast zipped pocket and an under lid mesh pocket. Inside you will only find a separation for a water pouch. 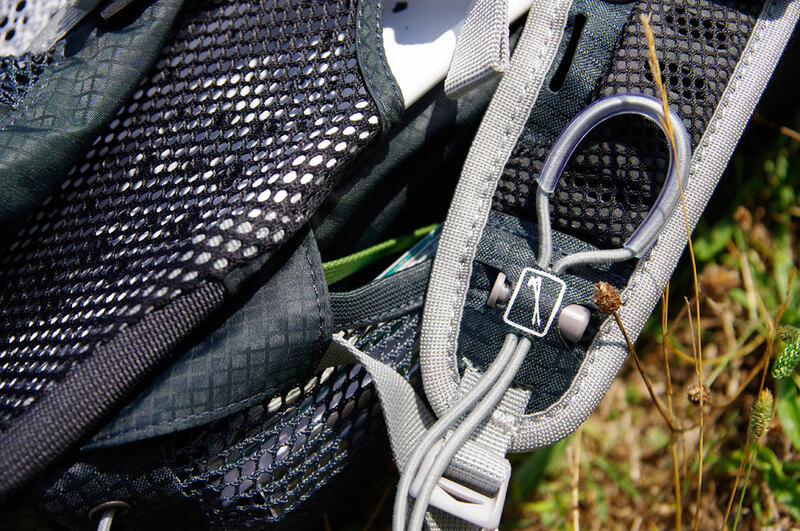 There are two hydration exits, one on each shoulder, marked by a “H2O” symbol, and a small strap to hang the pouch and keep it vertical. 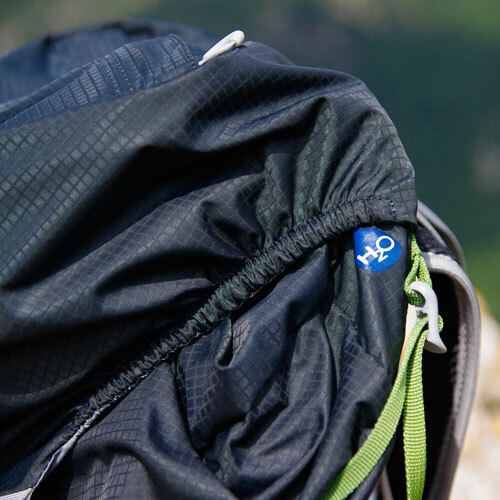 The bottom is reinforced and features two straps that could be used for a sleeping pad or a tent. Next to those, at the front of the pack, you will find the pick-axe hoop. 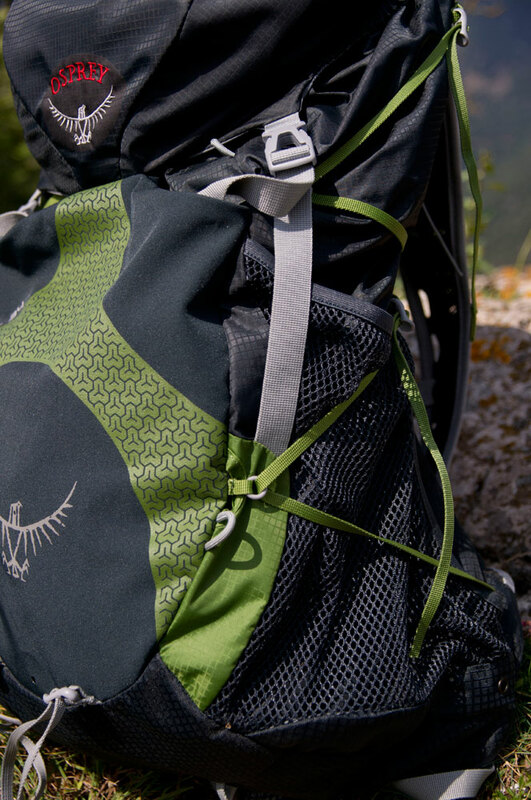 The Exos 34 also comes with Osprey’s “Stow on the go” trekking pole attachment. This consists of a two hoops, one on the left shoulder strap and one at the bottom left of the pack. This arrangement is meant to let you attach your trekking poles without pause. 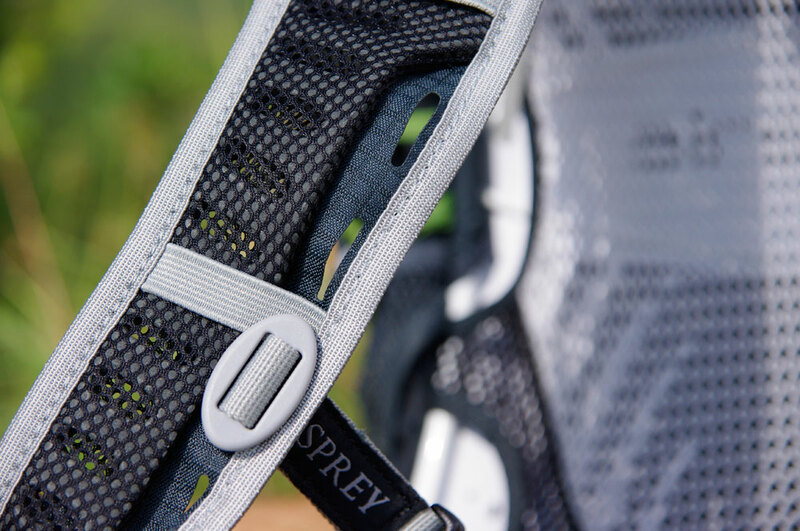 To regulate the size, Osprey provided two sets of compression straps on each sides plus a vertical one attached to the front pocket. That’s a lot of straps. Although it’s nice to have the possibility of adapting the shape, it translates in a lot of dangling bits that can get in the way. Add to it that most regulation straps, like for the belt and the harness, are unnecessarily long. Some sort of attachment to keep them away would have been nice. Alternatively, once you have adjusted the pack to your liking, it might be good to just cut them shorter. As I said in intro, and one of the reasons I choose this pack is its suspended backpanel. 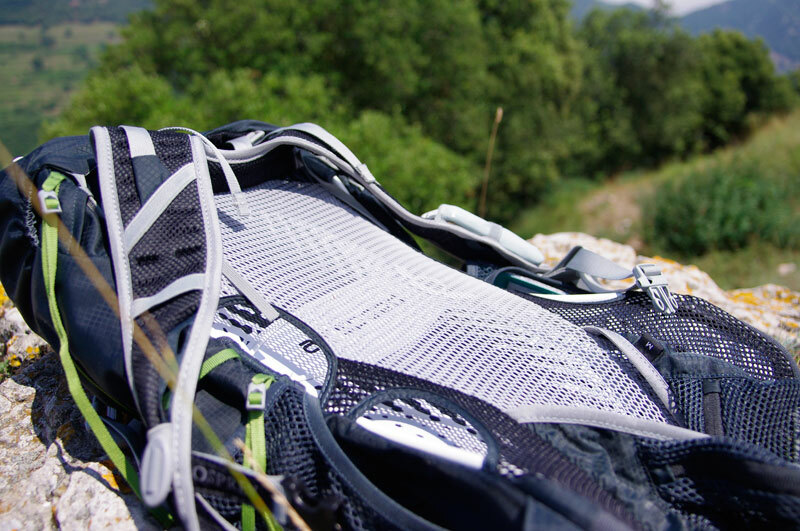 Osprey’s tech is dubbed “Airspeed” and consists of a tensioned breathable mesh fabric around an aluminium frame. There are large ventilation holes on the sides to keep the air circulation going and the shoulder straps are also ventilated. You’d be surprised how well this works. When cycling, I could literally feel the wind in my back and even after a good hour I was still dry and cool. During treks it also positively affected how much my back got hot. Combined with a breathable t-shirt it will keep you pretty much dry even after hours of effort. Where suspended backpanels also improve over traditional ones is in comfort. No more bumps sticking out in the middle of your back. Regardless of how you load up you pack, nothing will touch you directly because of the space left between the mesh on the frame. I found the shoulder straps a bit less comfy. The are breathable yes but to get there they had to shave off some foam and you definitely feel it. Not a deal breaker if you keep the weight down but probably uncomfortable if you carry heavy stuff. One good point is the adjustable sternum strap which can be moved up and down for a better fit. It also has a whistle built in the plastic clip. Clever! I am very pleased with the Osprey Exos 34 (yes, that’s an affiliate link). It’s roomy, very very light and full of nice ideas and features. And now that I have tasted the suspended backpanel I will probably never wear anything else, the benefits are just too good. A shame its got all those dangling bits and straps. Something a bit more stream lined, like the Osprey Stratos series but with the back and lightness of the Exos would be the perfect pack for me. At around $150/£100 it’s certainly not cheap but I still think it is good value for money and it is backed by the “All Mighty Guarantee” which provide lifetime warranty against defects in material and craftsmanship.